A little less than a year before he canonized the 120 Chinese martyrs on October 1, 2000, in a message dated Dec. 8, 1999 on the eve of the new millennium, Pope John Paul II greeted all Catholics in China. The Pontiff noted that in China the celebration of the 2000th anniversary of the birth of Christ "will be an occasion for remembering the apostolic labors, the sufferings, the tears and the shedding of blood which have been part of the Church's journey among the people of every time." Then, citing a famous passage from the early Christian writer Tertullian — "the blood of the martyrs is the seed of the Church" — the Holy Father pointed out that "in your midst, too, the blood of your martyrs has become the seed of a multitude of authentic disciples of Jesus. My heart overflows with wonder and gratitude to God for the generous witness given by a host of bishops, priests, men and women religious, and lay people. And it seems that the time of trial, in some places, has not yet come to an end!" Unfortunately, this message is not echoed in Adam Minter's article Keeping Faith. Rather, his message is: "political expediency is the seed of the Church," which is totally false. In the course of conveying that message, Minter also distorts a great number of things, and they are too many to illustrate here. For this reason, I have to compare Minter to a blind man who attempts to explain to others the size and shape of an elephant. As he feels his way around the elephant, he explains to his readers that the trunk of the elephant is the elephant's tail. Minter's total dependence on Jin's words is no different. For example, Minter depicts Cardinal Kung as the trouble-maker, and Jin as the peace maker. He failed to note a very important point about Ignatius Cardinal Kung, Bishop Peter Joseph Fan Xueyan of Baoding, Bishop Dominick Tang Yeeming, S.J. of Guangzhou, and thousands of other living and deceased clergy, religious and laypersons. They continue to be the symbol of Catholicism and the source of strength for Roman Catholics in China for two reasons. First, they either laid down their lives or are still suffering for their Roman Catholic faith. (Among the latter are clergy who administer the sacraments in the most difficult and dangerous situations — an activity that Jin arrogantly characterized, and Minter reported, as "stupid.") Secondly and especially, they spent time in prison for refusing to renounce the authority of the Pope and for refusing to join the Chinese Catholic Patriotic Association – a positive and conclusive action of their true Catholic faith. The martyrdom and suffering of these people, together with the guidance of the Holy Spirit, are the reasons that the Roman Catholic Church in China has survived — "the blood of the martyrs is the seed of the Church" — and not because of Jin's "get(ting) things done now," as Minter described. Even statistics verify this truth. The underground Church has approximately 10 million faithful, while the government sanctioned official or open Church has only four million. There are more important issues that Adam Minter failed to point out. For instance, Jin stole the authority of the Bishop of Shanghai from Cardinal Kung while the papally appointed bishop of Shanghai, namely Cardinal Kung, was still living and was not retired. Kung was Jin's bishop. Jin should have been obedient to Cardinal Kung. Instead, in collaboration with the Chinese communist regime, Jin betrayed his own bishop and stole the diocese from Cardinal Kung. Sadly, Minter ventilated Jin's very poor excuse that "reject(ing) the appointment would not only place the seminary at risk, but also open the Shanghai hierarchy to a priest more inclined toward the CPA and the communist party." Jin made this self-serving excuse because he wanted people to perceive him as the irreplaceable savior of the Roman Catholic Church in China. Because Minter was so gullible to believe Jin in this self-serving excuse, your publishing it misled the public. Foreseeing what would happen to the Catholic Church under the communist leadership of Chairman Mao, in 1954 Bishop Kung led all his priests and seminarians to Sheshan Basilica for prayer. The bishop, all priests and seminarians, including Father Jin Luxian, took an oath before a statue of the Blessed Lady of Sheshan never to do anything to compromise their Catholic faith. The next year Bishop Kung and Father Jin were among those arrested and imprisoned, and efforts were made to get each of them to defect from the Roman Catholic Church and join the puppet Catholic Church, which is now known as the Catholic Patriotic Association. 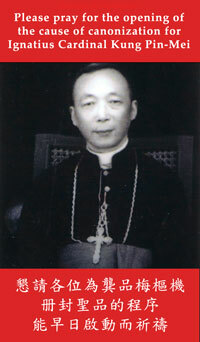 Bishop Kung was unwilling to defect and was eventually given a life sentence. Father Jin, S.J. was more pliable, however. In his book entitled The Catholic Church in China (ISBN 0-932088-12-0), the late Father Ladany, S.J., a renowned and internationally recognized China expert, made the following reference to Father Jin Luxian: "Several families suffered because of his confessions (page 65)..…The court verdict (we have the text of the verdict) stated that he was given "only" eighteen years because in jail he was willing to reveal the crimes of others. (pages 75-76)" Because of his collaboration, Jin earned the trust of the communists and worked as a translator under the government's Ministry of Security. One does not need too much imagination to visualize how comfortable a translator's "jailed" life must have been. Yet, Jin always used these 18 years as a credit for his service and sacrifice for his Church! Jin knows very well that the charges the Chinese authority levied against him and Bishop Kung were bogus when they were both arrested in 1955. However, in a press conference in Hong Kong when he was asked why Bishop Kung had been put in jail, Jin said (as Father Ladany described in his book The Catholic Church in China on page 75): Bishop Kung "committed crimes; he resisted the participation of China in the Korean war and hoped that the Americans would come to China." Jin willfully accused Bishop Kung of something seriously criminal that he knew very well was not true in order to gain his own political advantage. On November 16, 1987 Cardinal Jaime Sin of Manila visited China and was feted at a State banquet. Also present was the prisoner Bishop Kung, then under house arrest. The cardinal was not allowed to speak directly with Bishop Kung. Then, to liven things up in a very tense situation, each person present was invited to sing a song of his own choice. Bishop Kung, to let Cardinal Sin know that he was still loyal to the Holy See, sang the familiar hymn Tu es Petrus. After that, Jin, who was also present, remarked to Bishop Kung: "What are you trying to do, show your position?" Bishop Kung quietly replied: "It is not necessary to show my position. My position has never changed." At this time Bishop Kung's life sentence had been commuted to ten years of house arrest. Keeping guard over Bishop Kung as his official jailer was none other than Bishop Jin Luxian, now no longer a faithful helper of the true Bishop of Shanghai, Ignatius Kung, but instead a faithful collaborator of the communist government of China. I believe that the public likes to read fair and balanced articles. I am afraid that Keeping Faith is not one of them. "The blood of the martyrs is the seed of the Church." This message has echoed throughout the Catholic Church's history. Its authority rests upon Jesus' teaching "Blessed are those who are persecuted for righteousness' sake, for theirs is the kingdom of heaven." Unfortunately, this message is not echoed in Adam Minter's profile of Jin Luxian ('keeping Faith," July/August Atlantic). The message in that story is "political expediency is the seed of the Church." In the course of conveying that message, Minter distorts a great number of things. For example, he depicts Ignatius Kung Pin-Mei as a troublemaker, and Jin as a peacemaker. But Kung, Bishop Peter Joseph Fan Xueyan of Baoding, Bishop Dominic Deng Yiming of Guangzhou, and thousands of other living and deceased clergy, religious, and laypersons continue to be the symbol of Catholicism and the source of strength for Roman Catholics in China for two reasons: first, they either laid down their lives or are still suffering for their Roman Catholic faith, and second, they spent time in prison for refusing to renounce the authority of the Pope and for refusing to join the Chinese Catholic Patriotic Association. Their martyrdom and suffering, together with the guidance of the Holy Spirit, are the reasons that the Roman Catholic Church in China has survived - "The blood of the martyrs is the seed of the Church" - and not because of Jin's "get[ting] things done now" as Minter describes it. Statistics verify this truth: The underground Church has approximately 10 million faithful, while the government-sanctioned Church has only 4 million. Minter also fails to point out that Jin stole the authority of the bishop of Shanghai from Kung while Kung was not yet retired. 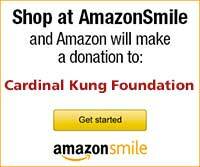 Kung was Jin's bishop, and Jin should have been obedient to Cardinal Kung. Instead, in collaboration with the Chinese Communist regime, Jin betrayed him and stole the diocese. Minter accepts Jin's explanation that "reject[ing] the appointment would not only place the seminary at risk, but also open the Shanghai hierarchy to a priest more inclined toward the CPA and the Communist Party." Jin made this self-serving excuse because he wanted to be perceived as the irreplaceable savior of the Catholic Church in China. Several families suffered because of his confessions…The court verdict (we have the text of the verdict) stated that he was given "only" eighteen years because in jail he was willing to reveal the crimes of others. Because of his collaboration, Jin earned the trust of the Communists and worked as a translator under the government's Ministry of Security. One does not need too much imagination to visualize how comfortable a translator's "jailed" life must have been. All is well known, Bishop Kung, while still in a Communist prison, was named a cardinal in secret in 1979. He was publicly proclaimed a cardinal in the consistory of 1991. When he received the cardinal's insignia, the ovation lasted seven minutes. Upon Kung's death, John Paul II called him "this noble son of China and of the Church." In him are fulfilled the words of the Gospel: "Well done, good and faithful servant;…enter into the joy of your master."